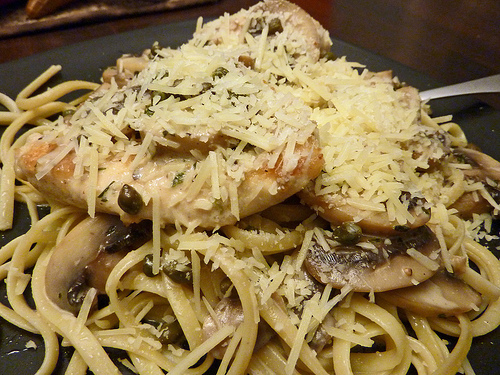 My love of capers knows no bounds — so we made Chicken Scallopine | write meg! So I’m kind of going through a thing with capers. It all started on my birthday weekend in July, when Spencer and I went up to Annapolis and had dinner at The Cheesecake Factory. If you’ve never been to a Cheesecake Factory, friends, let me caution you: don’t. It’s so good, fatty, filling and delicious, it will ruin you for every other restaurant. And, um, the cheesecake? Cheesecake, people. In a billion different varieties. But if you’re going for dessert, you should skip the whole meal thing altogether. By the time you’re done plowing through your massive entree, any space in your belly for cool, scrumptious cheesecake will have been invaded by meatloaf. On this particular evening, riding high off a solitary strawberry margarita in honor of the 25th anniversary of my birth, I ordered a chicken piccata dish. On a whim. Because it featured a lemon and caper sauce and, well, that sounded good. So I ordered it. Spencer and I chatted and made moony, lovey faces at each other. I drank more of my margarita. And then my chicken piccata came. And it was the most delicious thing I’ve ever had in my life. 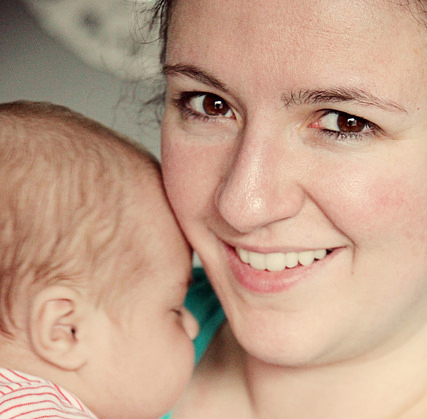 Was it the perfectly-cooked chicken dripping in the lemon herb reducation? Or maybe the mushrooms — wow, I love mushrooms. Perhaps it was the tender pasta drenched in all that delicious sauce, or . . . Yes, yes, it was the capers. Totally the capers. After discovering this recipe for Chicken Scallopine over at The Pioneer Woman, one of my favorite blogs, we went to work. And everything went swimmingly! Aside from a mishap wherein I dropped the jar of capers (eek), our stove wouldn’t get hot enough to reduce the white wine (another eek) and our linguine became sticky from sitting too long while the chicken fried (our fault for boiling it too quickly), it was delicious — and relatively simple. I’d recommend it — especially if you’re all into capers, like I am. Though the recipe calls for a “heaping teaspoon” of the delicious little pickled buds, I could have happily added the entire jar to our pan. And next time? I’ll be doing just that. 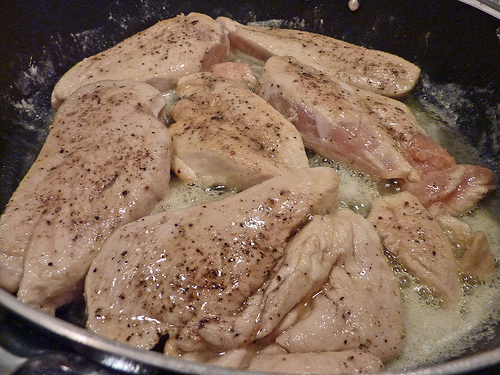 Flatten chicken breasts to uniform thickness. Salt and pepper both sides, then dredge in flour. Heat butter and olive oil in a large skillet over medium heat. Fry chicken breasts until golden brown. Remove to a plate and set aside. Throw mushrooms into the pan and stir. Immediately pour in wine and chicken broth (optional), and then squeeze juice of 1/2 to 1 lemon. Stir to deglaze the pan, and then cook vigorously for 1 minute, until sauce reduces. 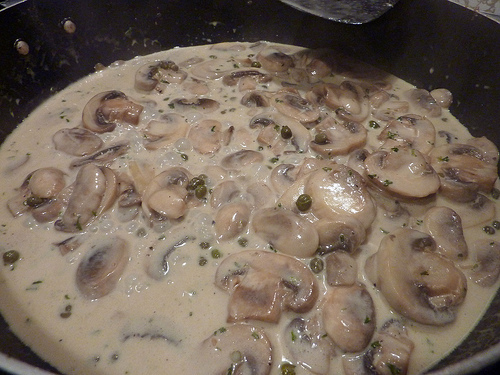 Pour in cream and stir, then add capers and parsley and stir. Turn off heat. Stir and add salt and pepper to taste. Don’t under salt! Place pasta and chicken on a platter and top with every last drop of sauce. Generously sprinkle Parmesan Cheese over the top. I would make this, but without the mushrooms. I do not like mushrooms! I do like capers though, oddly enough! Lexi, seriously — no mushrooms?! I’m going to have to reevaluate our friendship. …Kidding. 🙂 You’re not alone in your anti-fungi seriousness. And capers are the best! Yum, yum, yum. I may need to make this this weekend. 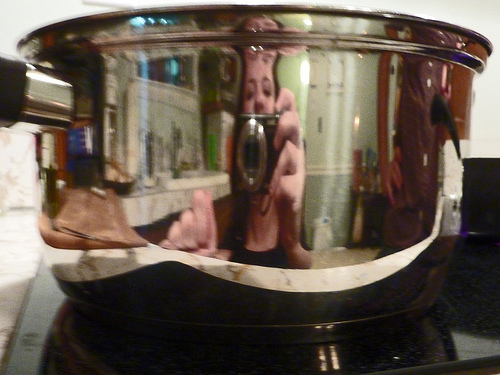 Also, I may need to buy the Pioneer Woman’s cookbook. PW’s cookbook is great fun, though I’ve only made two recipes from it — tomato soup and a dessert (I forget which one… shameful, I know!). I bought it mostly because I love her, and her photos are even more entrancing when you’re holding them in their hot little hands! Reading this and looking at those photographs this early in the morning was a bad idea. Now I’m feeling ravenous. Sorry to do that to you, Alex! And I’ll be sure to YouTube that “King Of The Hill” episode — sounds like Bobby and I have much in common! I use to hate capers. But that’s totally changed. They’re pretty amazing. And now I’m so hungry. Obvs I need to read your blog at night, when I’m home and food is at hand! That looks so yummy. I love Pioneer Woman! This sounds and looks absolutely yummy. I live pretty near a Cheesecake Factory, and unfortunately (or fortunately) never been there. I could eat cheesecake for dinner, yes, I could. I love capers as well!! I’m a vegetarian, so I might have to make this dish minus the chicken — I’m all over the linguine, YUM! I love the mushrooms and the capers and the chicken and the wine and the lemon…and the pasta. I love capers and make a mean chicken piccata, but the chicken scallopine looks heavenly! Will be giving this one a try soon. I love everything about this recipe. And I’m with you on the caper love. Thanks for linking up. Loved you post. Great photos. This looks DELICIOUS. I’ve been looking for some new recipes to try, and I love The Pioneer Woman, too, so this is going on my list! This looks and sounds very yummy. I need to try this recipe. Thanks for the post. I’m vegan and even I know that food looks good! Well, done! I’ve made a similar recipe with some surprisingly tasty faux chicken (I know it’s hard to believe it exists, but my meat-eating friends swear that even they think it is good). Yum.